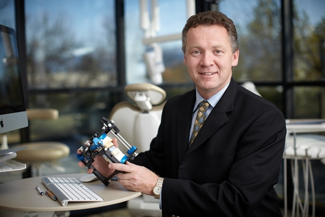 Dr. Duncan Chambers is a Board Certified Dental Specialist in Prosthodontics with 23 years of clinical experience in restoring smiles, fixing broken/worn teeth and replacing single missing teeth as well as multiple missing teeth with dental implants. After completing four years of dental school, Prosthodontists receive an additional three years of comprehensive training in an accredited graduate program. The Canadian Dental Association recognizes prosthodontists as specialists in tooth restoration and replacement. We take great pride in providing our patients with aesthetically attractive and natural looking replacement teeth. Prosthodontists are experts in the restoration and replacement of teeth, making smiles look beautiful and function the way that they should. If you’re embarrassed and self-conscious of your smile…if missing, broken or worn down teeth make eating unappetizing…if life with dentures is a slipping, painful struggle…we’re here to help. He is a Board Certified Dental Specialist; a highly educated, uniquely trained and experienced expert at replacing and restoring missing or damaged teeth…stabilizing dentures with dental implants…creating beautiful smiles and restoring lost function and oral health. He is passionate about what he does and loves to share his experiences and knowledge on how to treat complex dental cases. He has lectured extensively to dentists across Canada. Dr. Chambers offers you over 20 years of clinical experience and his practice is committed to the highest standards of patient care, technical excellence and the utilization of the most modern technology available. Originally from Red Deer, Alberta and with both parents being teachers; his family spent many summers in the beautiful Okanagan. After 23 years of dedicated service caring for the dental needs of Canadian Soldiers across Canada he is very pleased to return to the Okanagan to raise his family and provide dental service to the families in the Okanagan Valley. Dr. Chambers has always been passionate about dentistry and remains current on new dental treatments and dental technology. 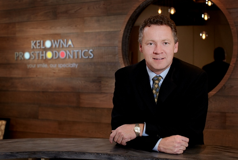 He has lectured extensively throughout Canada on Prosthodontics and Dental Implant Dentistry. Dr. Chambers has helped thousands of patients restore their healthy, natural and beautiful smiles. He takes great personal satisfaction in witnessing the transformation as patients become accustomed to their new look and improved function. If you want quality treatment by a Board Certified Dental Specialist that really cares please make an appointment to discuss your dental needs.